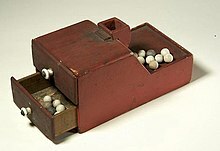 An early ballot box in which balls were used to cast the ballots. This box, once used by the Association of the Oldest Inhabitants of the District of Columbia, a social club, is in the collection of the National Museum of American History in Washington, D.C., USA. Borrowed from Italian balota (obsolete), ballotta (“small ball, especially one used to register a vote”), from balla (“bale, bundle”) + -otta (“suffix forming diminutive nouns”); or from Middle French balote (obsolete), ballotte (“small ball used to register a vote”) (also compare Middle French balotiage, French ballottage (“second ballot, runoff”)). Originally, a small ball placed in a container to cast a vote; now, by extension, a piece of paper or card used for this purpose, or some other means used to signify a vote. The process of voting, especially in secret; a round of voting. The total of all the votes cast in an election. (chiefly US) A list of candidates running for office; a ticket. To vote or decide by ballot. “ballot” in le Trésor de la langue française informatisé (The Digitized Treasury of the French Language).